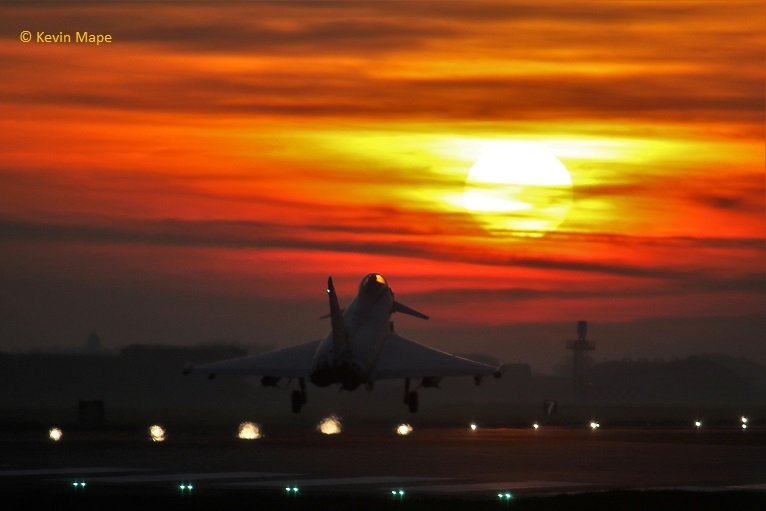 With the dark early nights “The Sunset season” is with us, ZK351/BU/ returning on 31/10/16. 1st Tue Log thanks to Steve & Val & Garf. ZK318/FG/Unmarked – APU runs outside TMF. ZK345/EP/Unmarked – Noted outside HAS 60. G-MAJJ/JJ/Eastern/ Jetstream 41 c/s “East Flt 102” in “103” – out. ZK372/Unmarked – Noted on the ASP. “Cobra 53” – Ground abort. ZK318/FG/Unmarked – TMF to Hangar 2. G-MAJJ/JJ/Eastern/ Jetstream 41 c/s “East Flt 104” in “105” – out. G-MAJJ/JJ/Eastern/ Jetstream 41 c/s “East Flt 101” in “102” – out. ZK345/EP/Unmarked c/s “Ascot 9541” – To Cyprus. 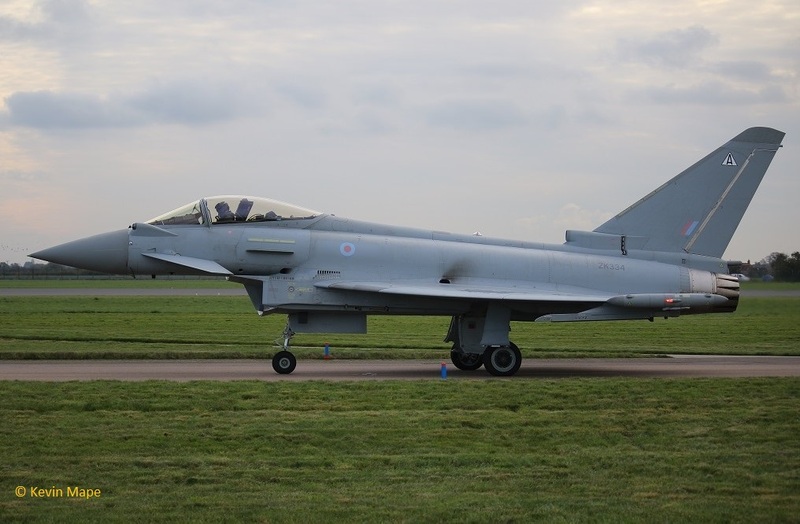 ZJ806/BE/29(R)Sqn c/s “Typhoon 35” – Display. G-FFRA/FA/Cobham/Falcon 20 EW c/s “Rushton 81” – Parked on the ASP. G-FFRA/FA/Cobham/Falcon 20 EW c/s “Rushton 81” – Departed. 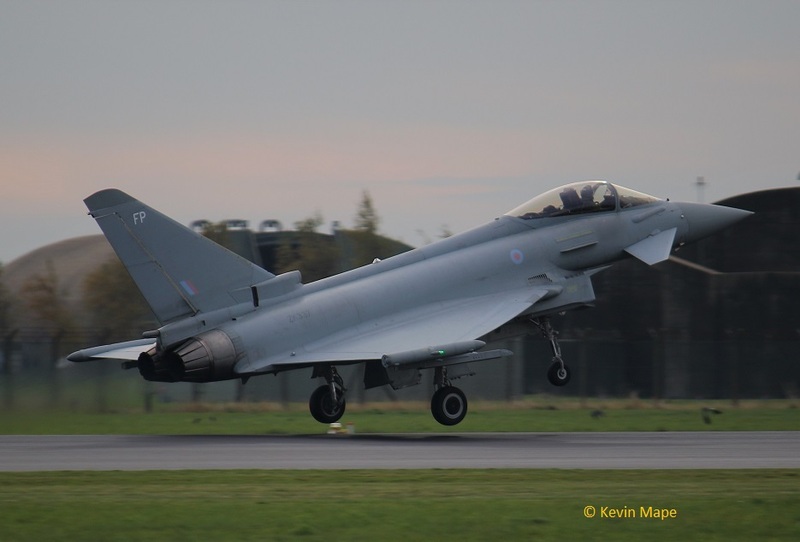 ZK327/FR/1(F)Sqn c/s “Lossie 93” – Delivery back to Lossiemouth. 4th Thur Log thanks to Garf. N506JA/ AS350 – Overfly 11-07 am heading South ex Glasgow. ZJ923 / (DM) – QRA radio check – 11-33 am. ZJ917/DG/ – QRA radi check – 11-58 am. 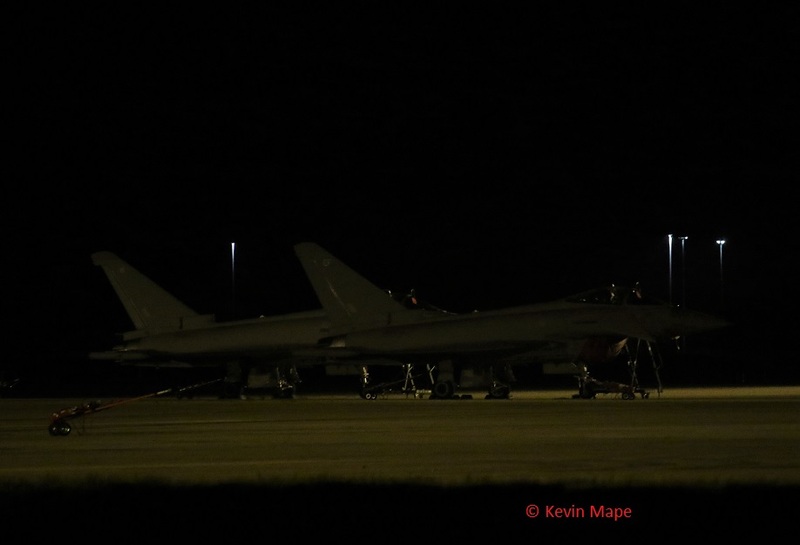 ZJ923/Unmarked c/s “Kilo 5 Sierra 32” – QRA practice. 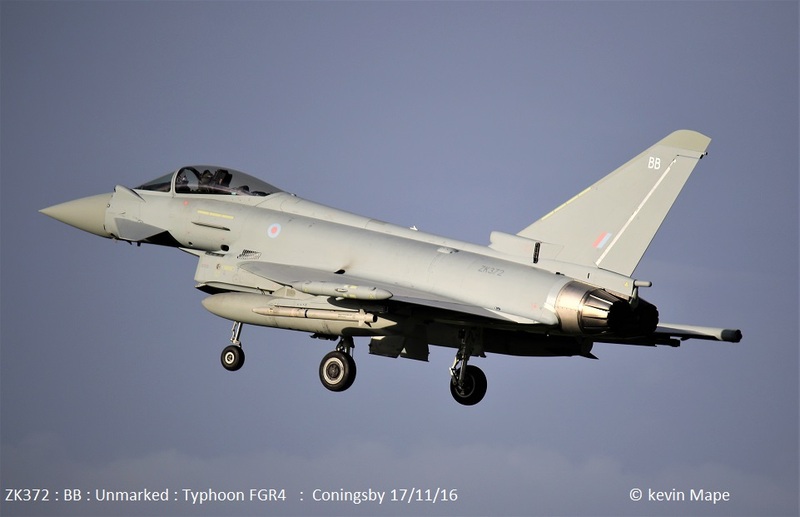 ZK372/Unmarked c/s “Typhoon 05” – First flight since Delivery. 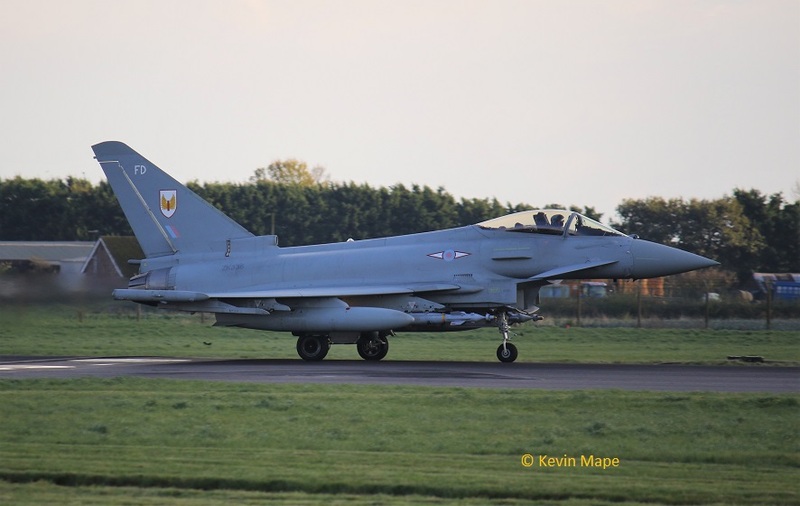 ZK308/BW/Unmarked c/s “Lossie 79” – delivery to Lossiemouth – first time noted code only. 4th Fri Log thanks to Garf. ZK352/BV/Unmarked c/s “Cobra 23 ” – To Linton. 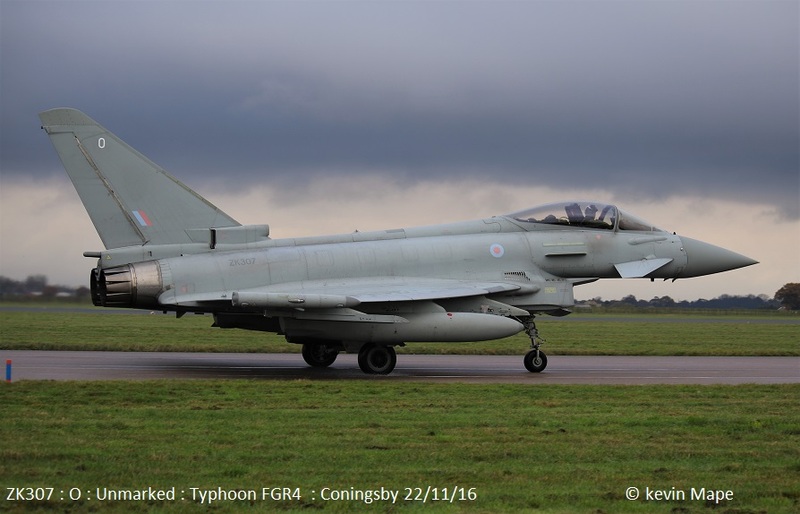 ZK372/Unmarked c/s “Warlord 11” – first mission of a Tranche 3 with 29(R)Sqn. ZH536/Northolt Stn Flt/Islander CC2 c/s “Ascot 7940” – Parked on the Southside. To Has 61. 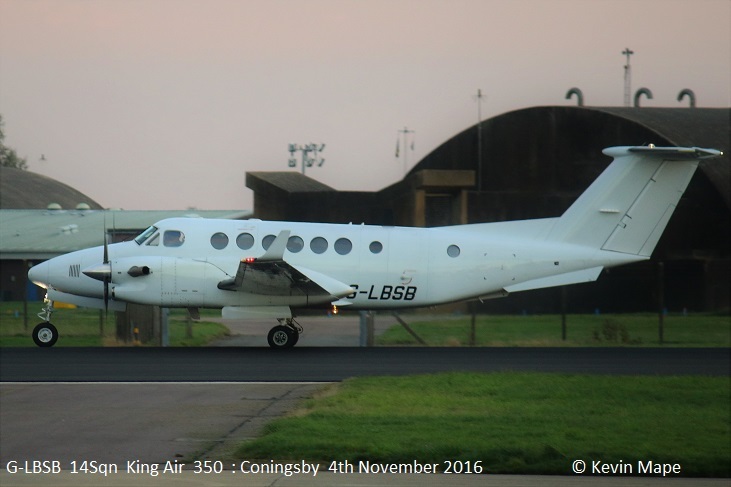 G-LBSB/14Sqn/King Air 350 c/s “GSB” – Parked on the ASP- departed to Northolt. TMF -ZK334/A/Unmarked – Parked on the ASP. 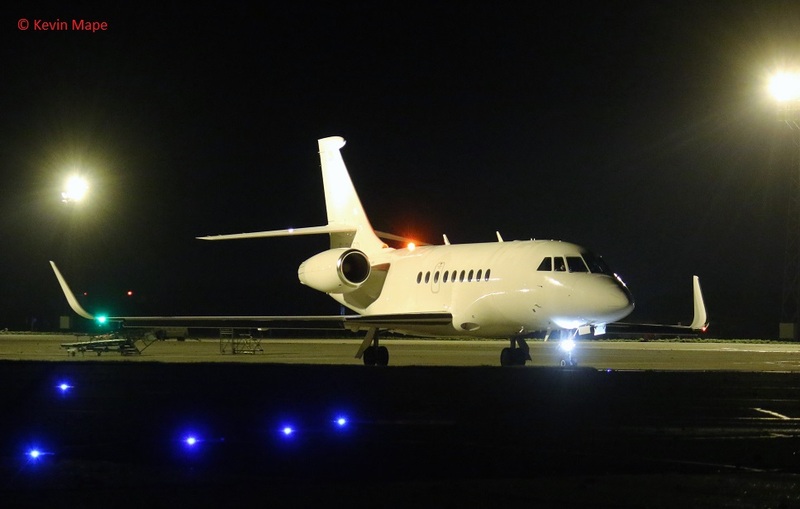 No.86/F-RAFB/ET00.060/ Falcon 7X c/s “Cotam 1277” – Parked on the ASP – Departed 12-15 pm. ZK458/D/45(R)Sqn/King Air B200GT c/s “Cranwell 67” – Overshoot. G-FRAK/AK/Cobham/Falcon 20 EW c/s “Vader 63” – Parked on the ASP. 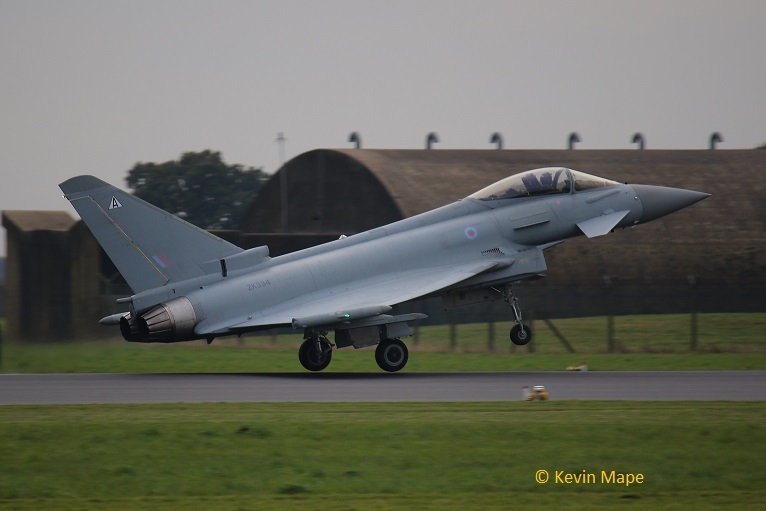 ZK336/FD/1(F)Sqn c/s “Rebel 86” – 2 x Live Paveway. ZG779/136/Unmarked/Tornado GR4 c/s “Jackel 22” – PD with swept wings. ZH536/Northolt Stn Flt /Islander CC2 c/s “Ascot 7955” – Departed. 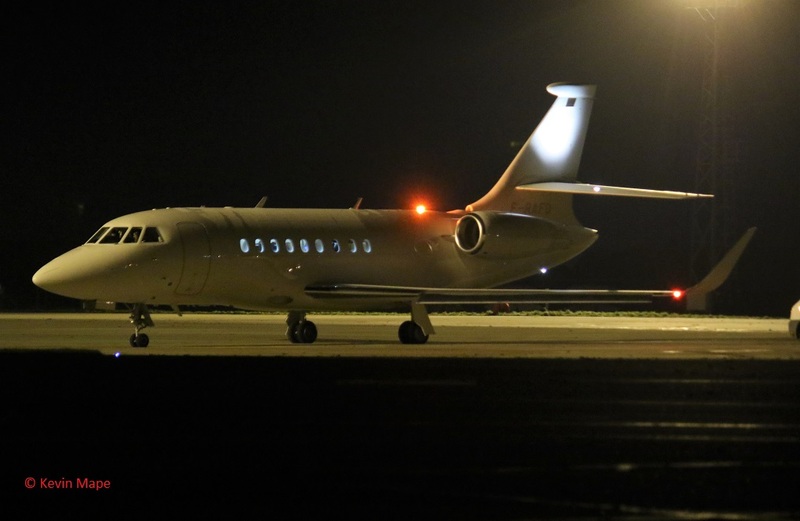 G-FRAK/AK/Falcon 20 c/s “Vader 62” – Departed. 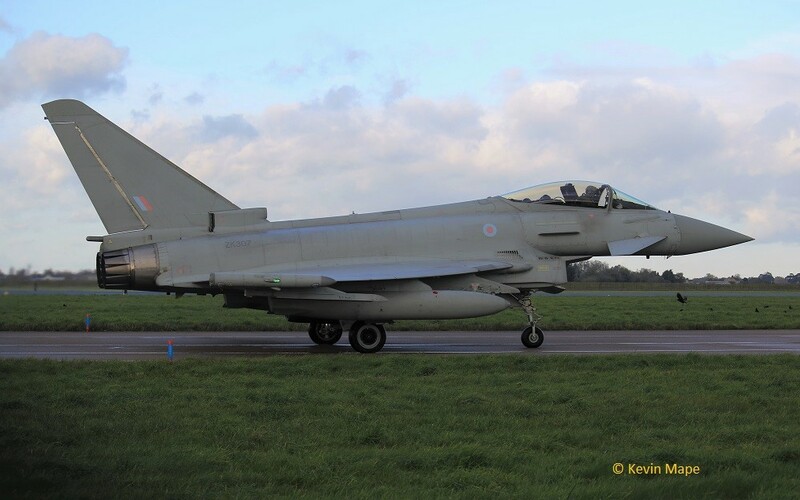 ZK336/FD/1(F)Sqn c/s “Triplex…..” – change of c/s no paveways – Landed. 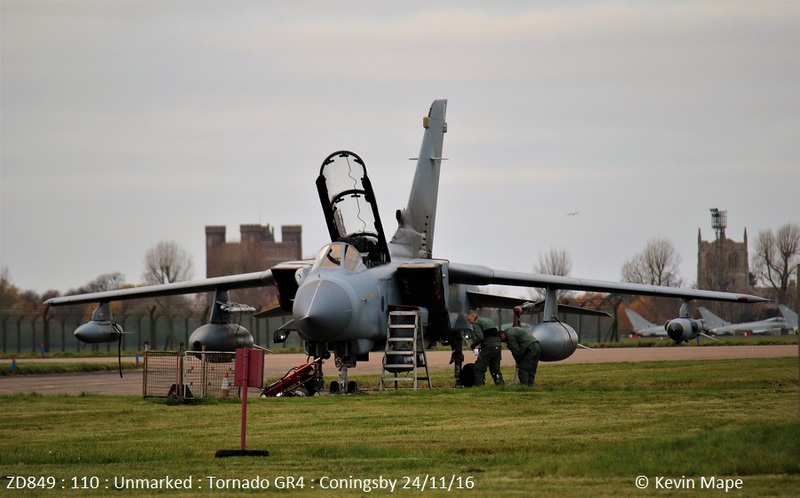 ZA559/049/Unmarked/Tornado GR4 c/s “Jackel 31” – emergency landing bird strike – Parked on Sierra. ZH536/Northolt Stn Flt /Islander CC2 c/s “Ascot 7955” – To HAS 56. No.287/F-RAFD/ET00.060/Falcon 2000LX c/s “Cotam 1282” – Parked on the ASP. Departed 19-20pm. Noted on the Wash pan. – ZK317/ES/Unmarked. ZJ921 : E : u/m : noted outside TMF. 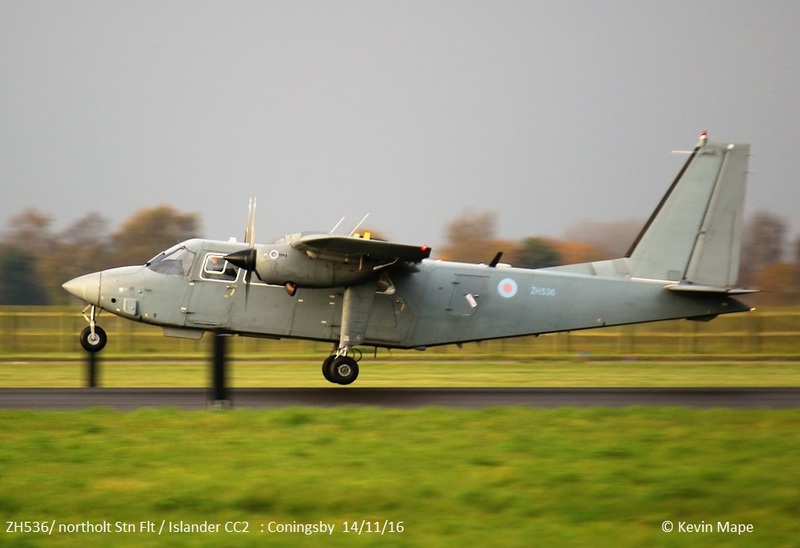 ZH536/Northolt Stn Flt/Islander CC2 c/s “Ascot 7956” – Mission. 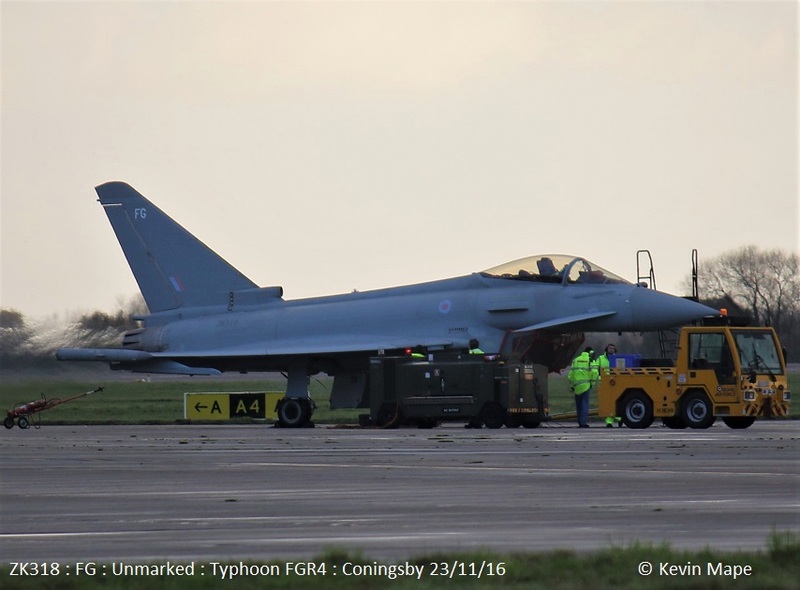 ZK334/A in Triangle/Unmarked : c/s “Typhoon 21” – Delivery back to Lossiemouth. ex TMF. 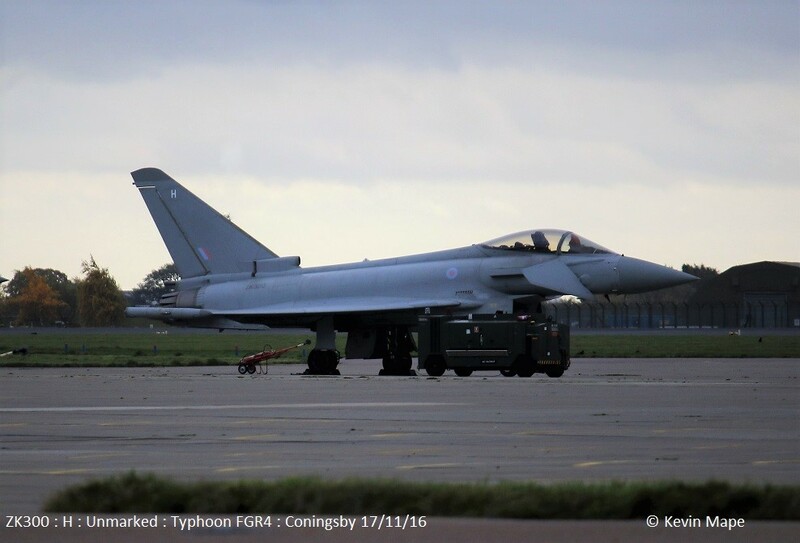 ZK337/FP/Unmarked c/s “Typhoon 76” – Delivery back to Lossiemouth. ex TMF. 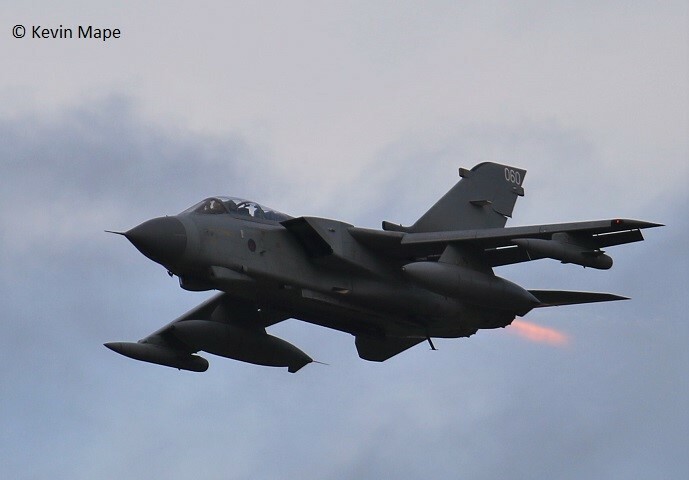 ZA594/060/QiniteQ/Tornado GR4 c/s “Tester 04” Overshoot. 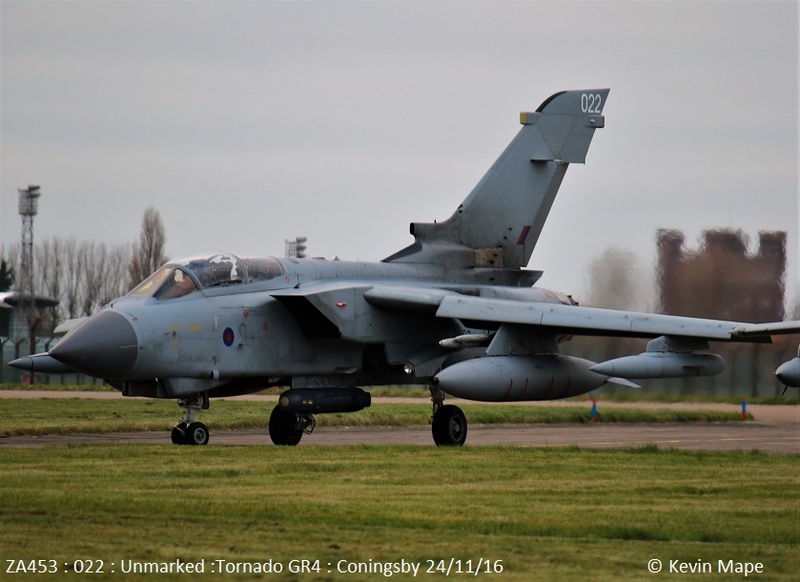 ZA559/049/Unmarked/Tornado GR4 – Noted on the ASP. ZK300/H/Unmarked – engine runs on the ASP. 9th Wed Log thanks to Susie Matson. 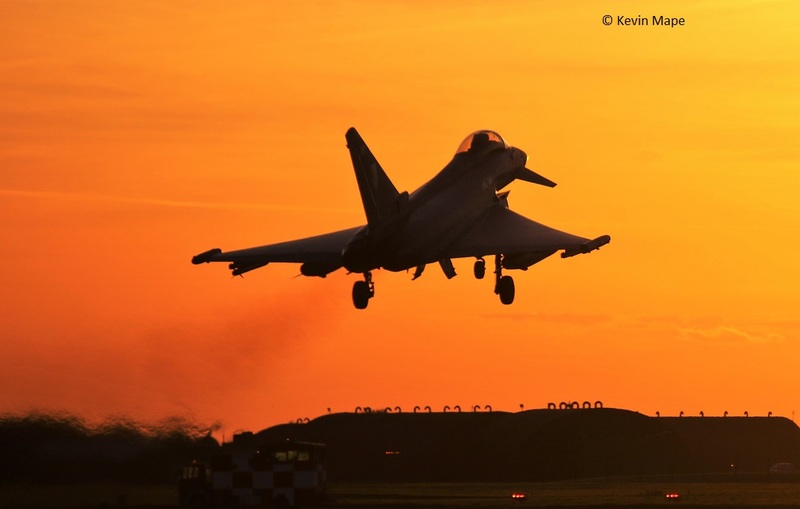 10th Thur Log thanks to Susie Matson & Rob W.
XX256/256/208Sqn/Hark T1A c/s “Pirate 08” – Departed. ZA553/045/Unmarked/Tornado GR4 c/s “Fang 22” – Overfly into Cranwell. 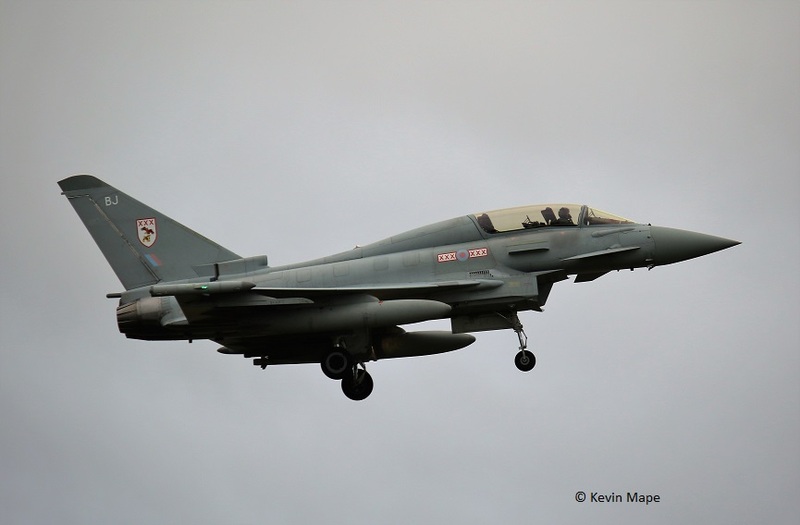 Noted in Echo – ZK330/FT/1(F)Sqn. 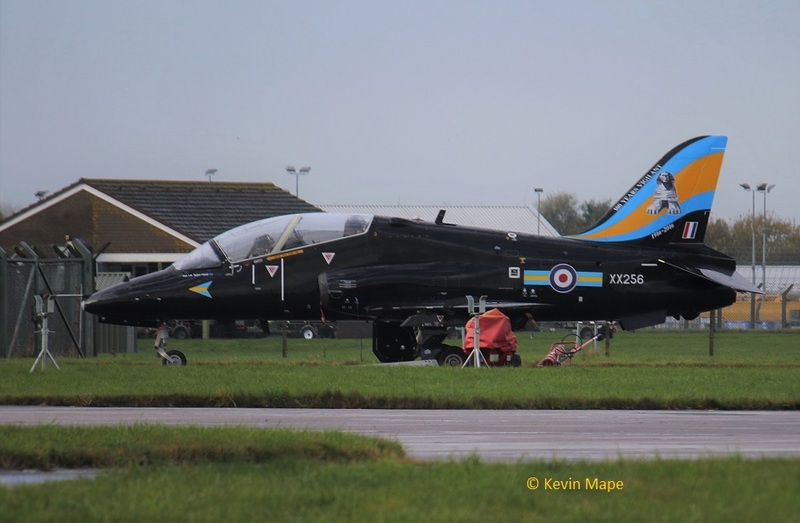 XX256/256/208Sqn 100 year tail/Hawk T1A c/s “Pirate 14” – Departed. 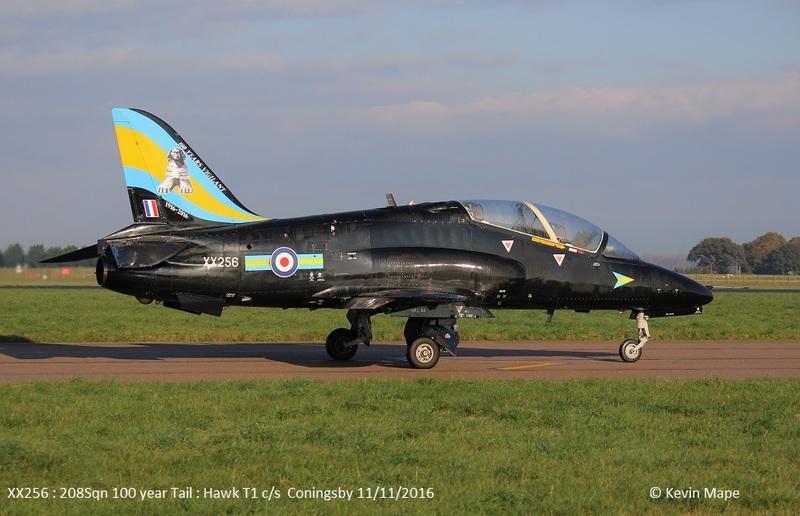 XX200/CO/100Sqn/Hawk T1A c/s “Pirate 16” – Departed. 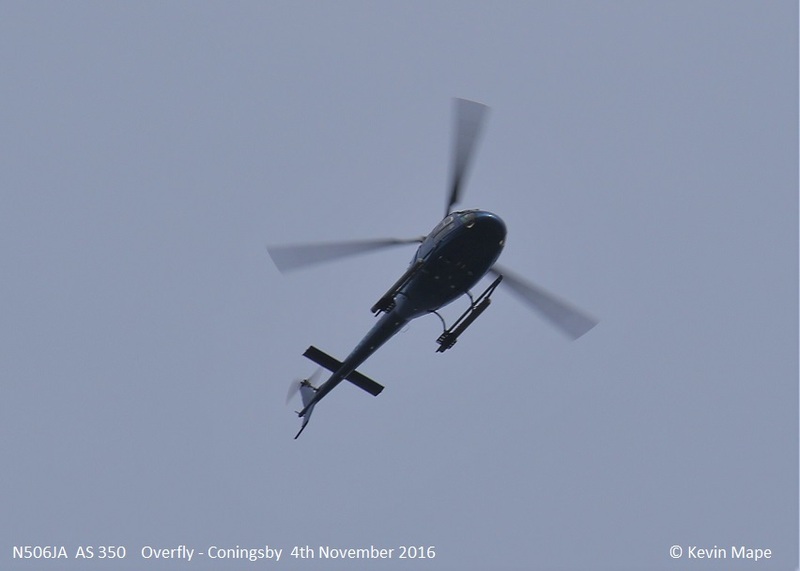 ZJ184/Apache AH1 c/s “Army Air 300” – Overfly – PD at Humberside. – 10-19am. 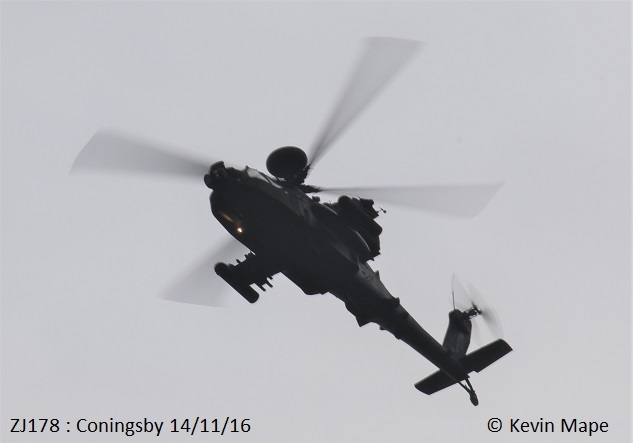 ZJ211/Apache AH1 c/s “Gunship 2” – Both landed at Leeming. ZK460/U/45(R)Sqn Poppy marks / King Air B200GT c/s “Cranwell 75” – Overshoot. 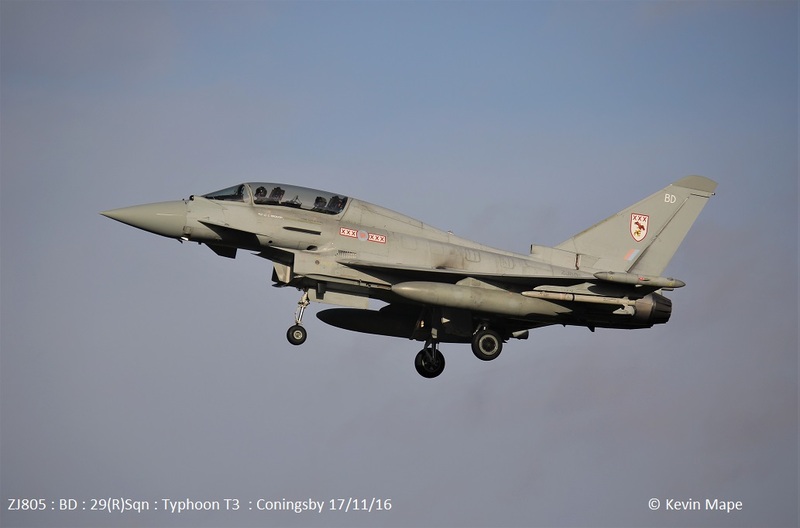 ZK313/W/Unmarked c/s “Typhoon 21” – Take off aborted. ZA559/049/Unmarked/ Tornado GR4 c/s “Bulkhead 12” – Overshoot. ZA710/18-27Sqn/Chinook HC4 c/s “Vortex 397” – Overfly to Donna Nook. – 13-19pm. ZE376/ Lynx AH9 c/s “Army Air 668” – Overfly North to South. 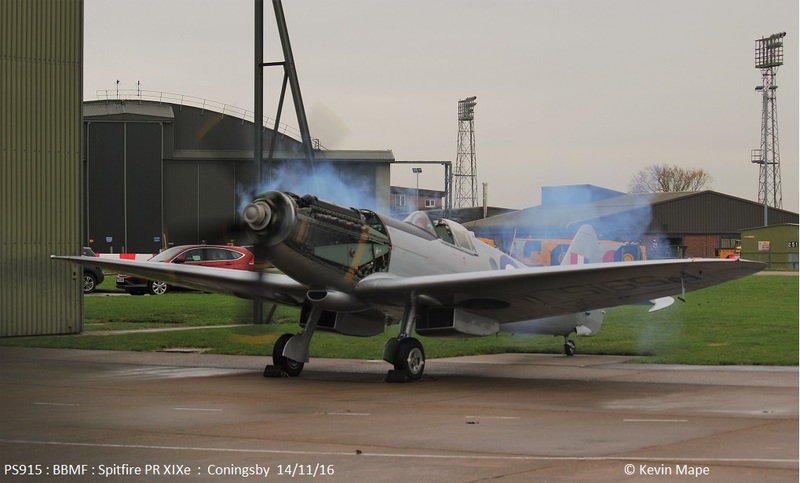 PS915/BBMF/Spitfire PR XIXe – Engine runs. ZH536/Notholt Stn Flt/Islander CC2 c/s “Ascot 7940” – To Sierra then Departed. ZK460/U/45(R)Sqn Poppy marks / King Air B200GT c/s “Cranwell 67” – Overshoot. ASP – ZK372/BB/Unmarked – first time noted with code. ZJ923/Unmarked – QRA change over – in – ZJ942/DH out. ZK455/O/45(R)Sqn/King Air B200 c/s “Cranwell 73” – Overshoot. ZK451/K/45(R)Sqn/King Air B200 c/s “Cranwell 75” – Overshoot. ZH536/Northolt Stn Flt/Islander CC2 c/s “Ascot 7957” – Mission. ZJ917/DG – QRA Radio check. 11-47am. “Razor 32” – Ground abort. G-COBS/Cobham/Da-42 Twin Star c/s “Calibrator 176” – Parked on Sierra. 12-0064/7SOS/CV-22B c/s “Knife 73” – Overfly heading North. ZJ929/DL – HAS 2 to HAS 4. 16th Wed Log thanks to Garf,Susie & Tina. Noted on Echo – FY,EO,GS,FK. 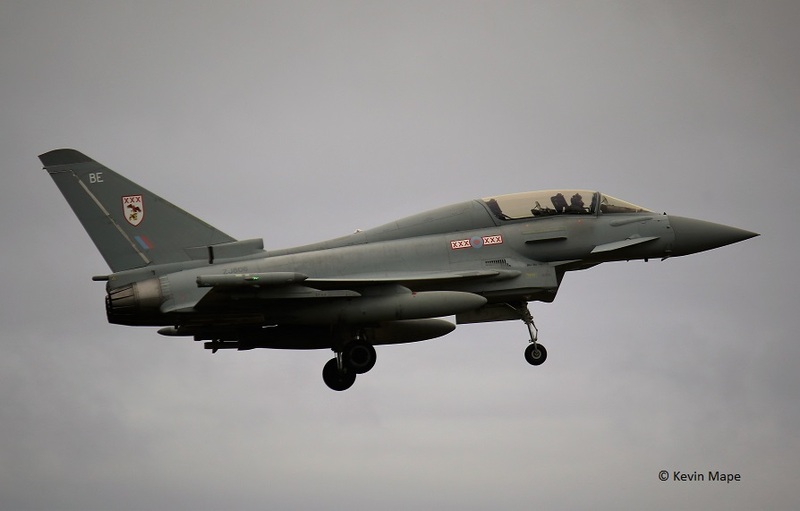 29(R)Sqn – EX, BJ, BD, BM, BB, BG, BK, BP, BE, BV, BC. G-COBS/Whales/Da-42 Twin star c/s “Calibrator 176” – To Waddiongton. ZK330/FT/1(F)Sqn c/s “Lossie 28” Parked on the ASP – For TMF. ZK372/BB/Unmarked c/s “Warlord 53” – f/f in code. G-BYVI/VI/Wittering wing/Tutor T1 c/s “Wittering 46 Yankee” – Overshoot. 177705/CC177 Globrmaster III c/s “Canforce 4058” – Overfly West to East. G-MAJJ/JJ/Eastern/ Jetstream 41 c/s “East Flt 105” in “106” – out. ZJ942/DH/ – outside HAS 1. Paint shop – ZJ921/E code only – Towed from paint shop to TMF. G-COBS/Whales/Da-42 Twin star c/s “Calibrator 176” – To Waddington. then return. 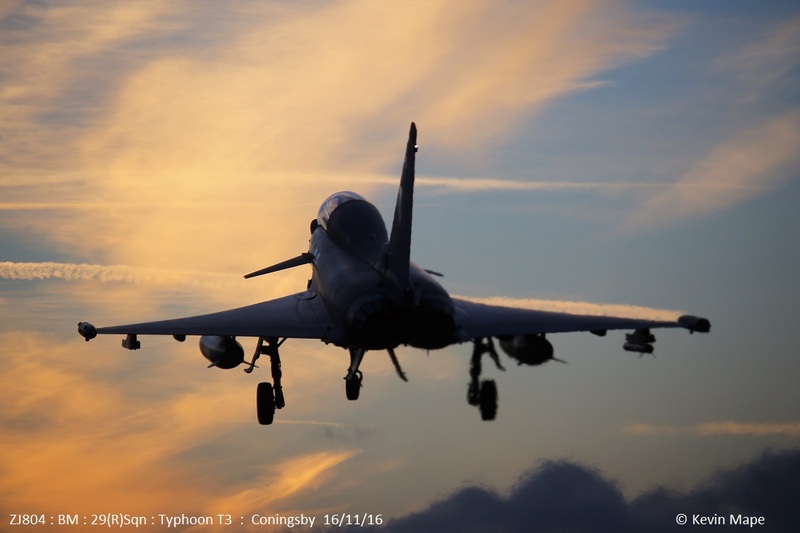 Operating overhead Coningsby on exercise Included. G-COBS/Whales/Da-42 Twin Star c/s “Calibrator 176” – To Waddington then returned. 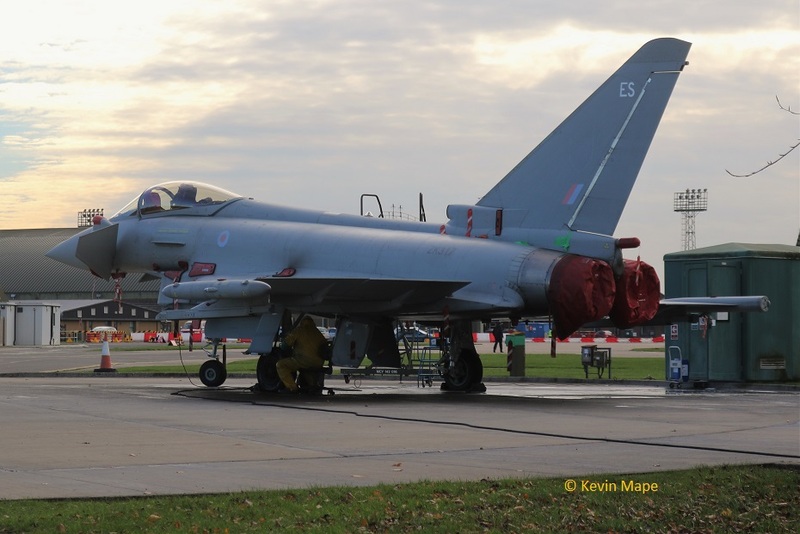 ZK300/H/Unmarked – Noted on the ASP f/n without II(AC)Sqn Triangle. G-COBS/Whales/Da-42 Twin Star c/s “Calibrator 176” – To Sierra. F-15’s/48FW c/s “Attack 81/82” operating overhead Coningsby. 06-0050/7SoS/CV-22B c/s “Knife 72” – Over fly – South to North. 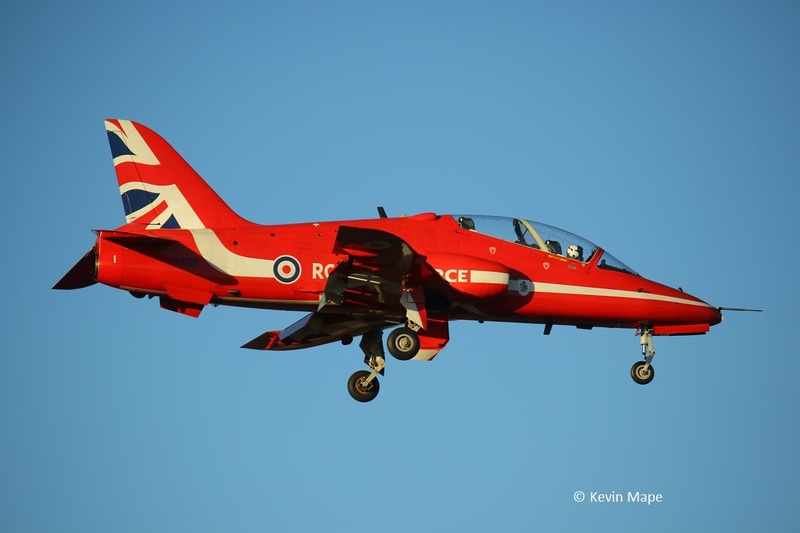 XX188/RAFAT/Hawk T1 c/s “Scampton 03” – Overshoot. 13-5786/7SOS/MC-130J c/s Strix 21″ – Overfly. G-COBS/Whales/Da-42 Twin Star c/s “Calibrator 176” – To Waddington . 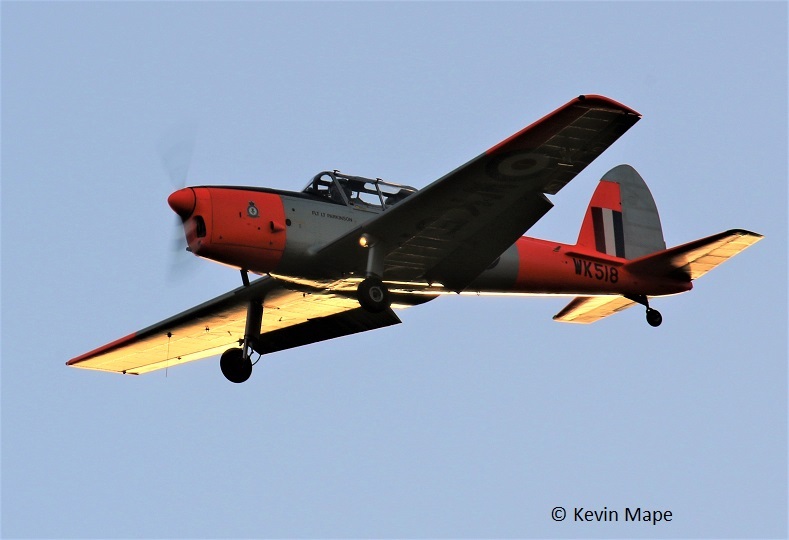 G-BYUC/UC/3FTS/Tutor T1 c/s “Cranwell 33” – Overshoot. 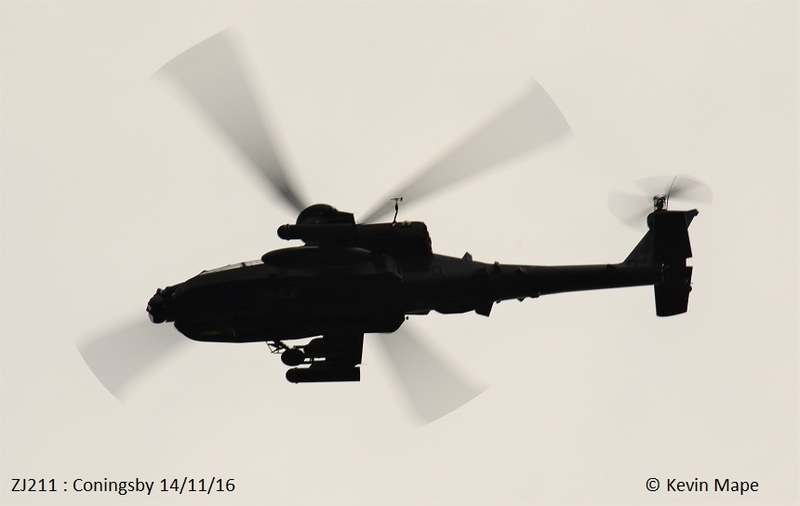 ZJ203/Apache AH1 c/s “Army Air 321” – overfly South to North. 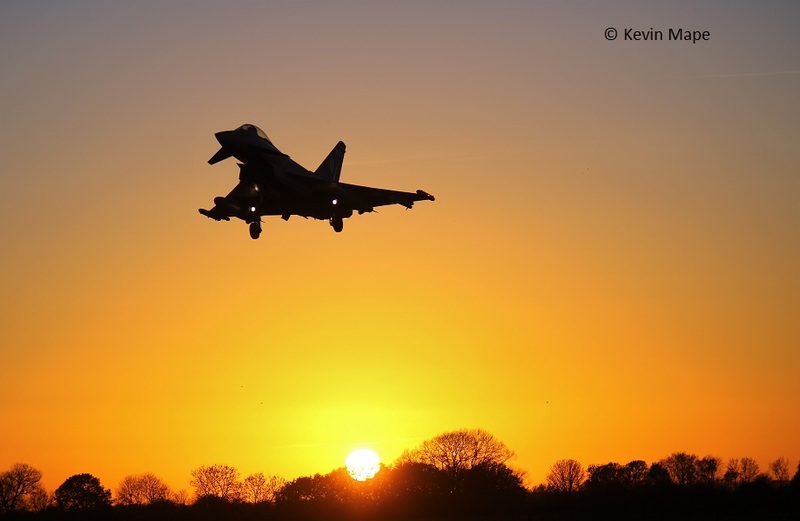 G-BYVT/VT/3FTS/Tutor T1 c/s “Cranwell 89” – Overshoot. 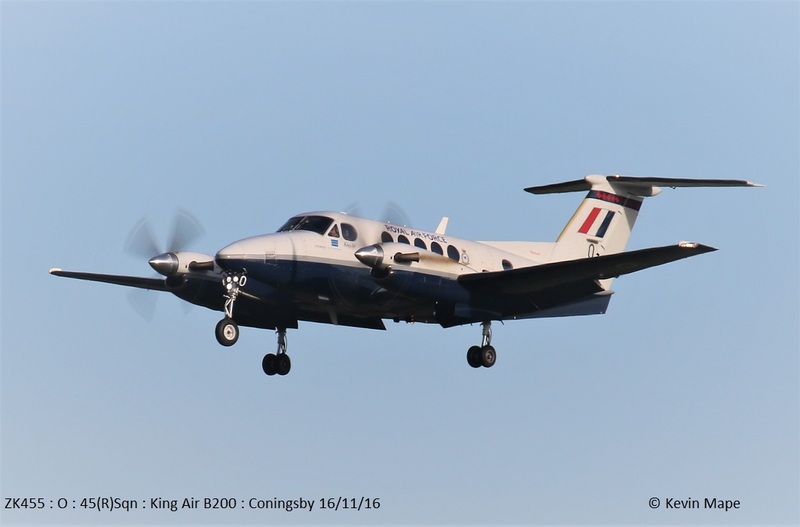 ZK451/O/45(R)Sqn/King Air B200 c/s “Cranwell 75” – Overshoots. G-COBS/Whales/Da-42 Twin Star c/s “Calibrator 176” – Parked on Sierra. ZF417/417/1FTS /Tucano T1 c/s “LOP 52” – Overshoots. 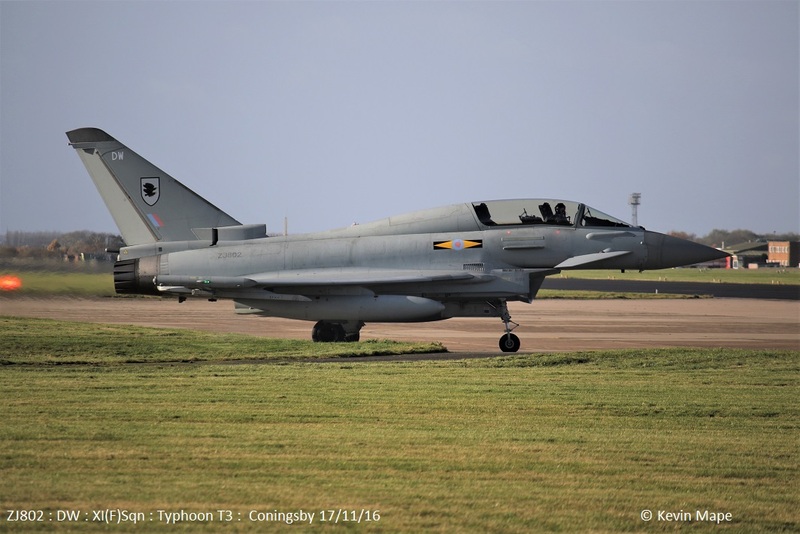 ZJ800/BC/29(R)Sqn c/s “Typhoon 115” – PD Marham. G-MAJJ/JJ/Eastern/ Jetstream 41 c/s “East Flt 103” in “104” – out. 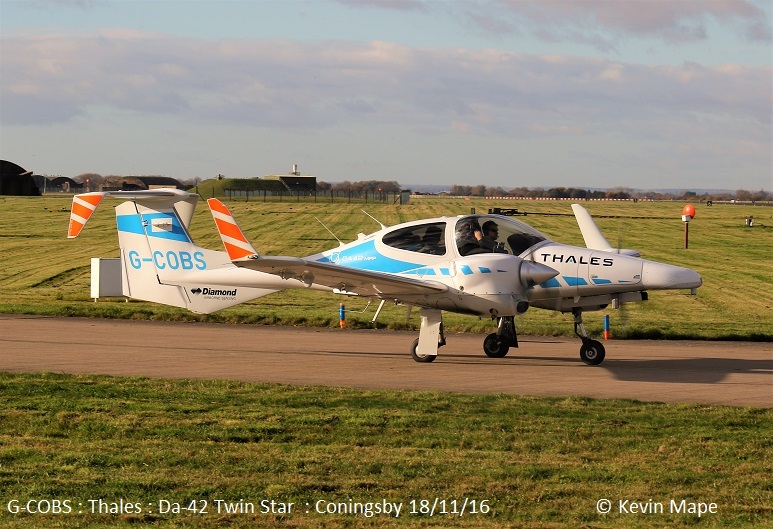 G-COBS/Whales/Da-42 Twin Star c/s “Calibrator 176” – Departed. 21st Mon – Heavy rain all day. asp : BC, BM, BD, BJ, BG, ZK930, BV, EX, DT, BE. ZJ692/5(AC)Sqn/Sentinel R1 c/s “Ascot 7337” – Parked on the ASP – Waddington diversion. ZA553/045/Unmarked/Tornado GR4 c/s “Bulkhead 11” – Overshoot. ZA370/004/Unmarked c/s “Bulkhead 12” – Overshoot. 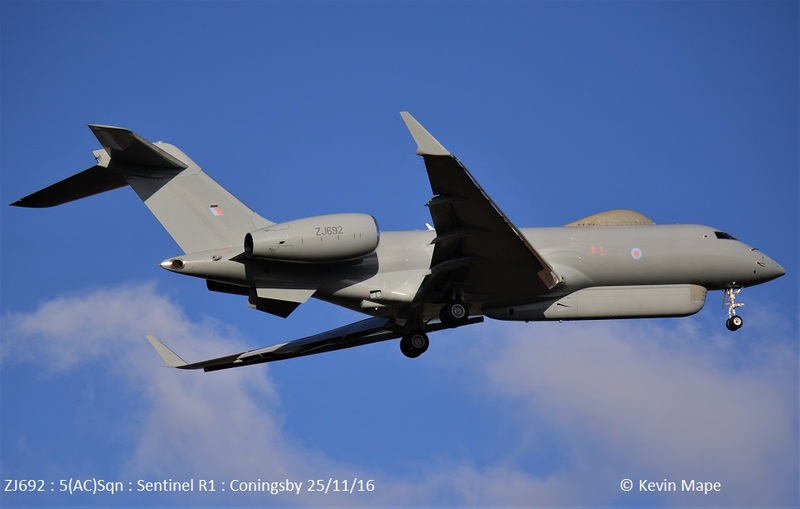 ZJ692/5(AC)Sqn/Sentinel R1 c/s “Snapshot 1” – Departed to Waddington. 19-30pm. ZJ929/DL – Noted on the Wash pan. ZK369/Unmarked – Engine runs on the ASP. “Warlord 11” – Ground abort. ZK307/O/Unmarked c/s “Havoc 21” – First time noted with O code. G-MAJJ/JJ/Eastern/ Jetstream 41 c/s “East Flt 104”- Parked on Sierra. 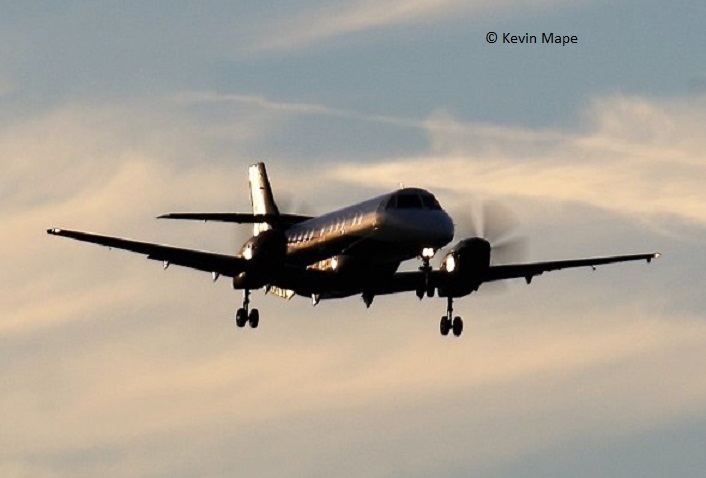 G-MAJJ/JJ/Eastern/Jetstream 41 c/s “East Flt 105” – Aborted takeoff. G-MAJG/JG/Eastern/Jetstream 41 c/s “East Flt 101” – in “034 Papa” – out. BBMF – MK356/5J-K – engine runs. Towed from Hangar 2 to Foxtrot – ZJ948. 24th Thur Log thanks to Garf. 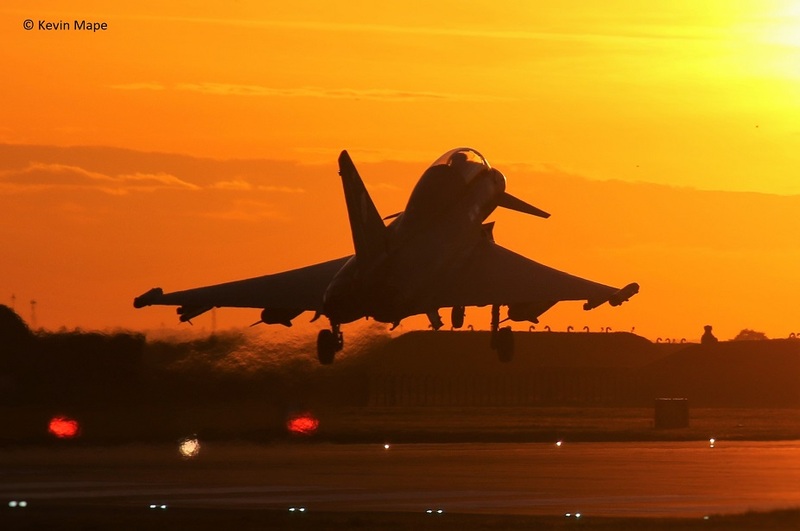 ASP – 29(R)Sqn – DT,BB,BM,EF,BD,ZJ930,BG,BJ,BV,EX,BP,BC,DL. TMF – 2 x FGR4. G-MAJJ/JJ/Eastern/Jetstream 41 c/s “East Flt 102” – in “103” – out. ZJ236/X/60(R)Sqn/Griffin HT1 c/s “Shawbury 94” – Parked on Sierra. G-LBSB/14Sqn/King air 350 c/s “GSB” – Overshoot. 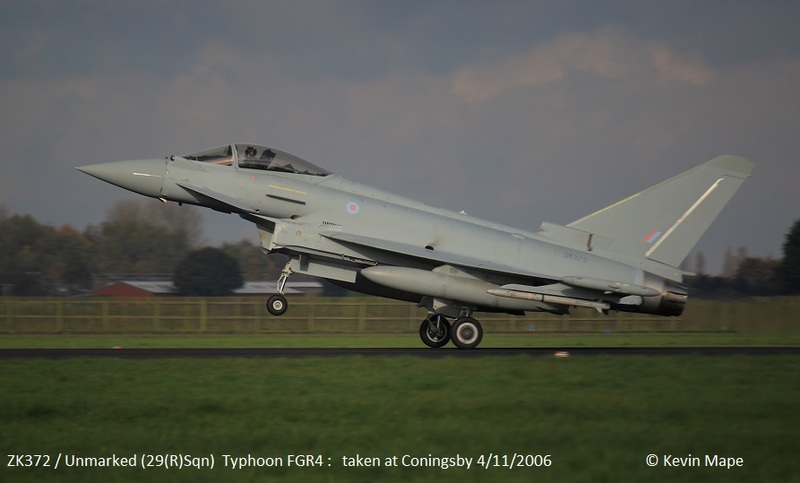 ZJ236/X/60(R)Sqn/Griffin HT1 c/s “Shawbury 94” – Departed. ZD849/110/Unmarked/Tornado GR4 c/s “Lossie 08” – Parked on Sierra. ZA453/022/Unmarked/Tornado GR4 c/s “Lossie 514” – Parked on Sierra. 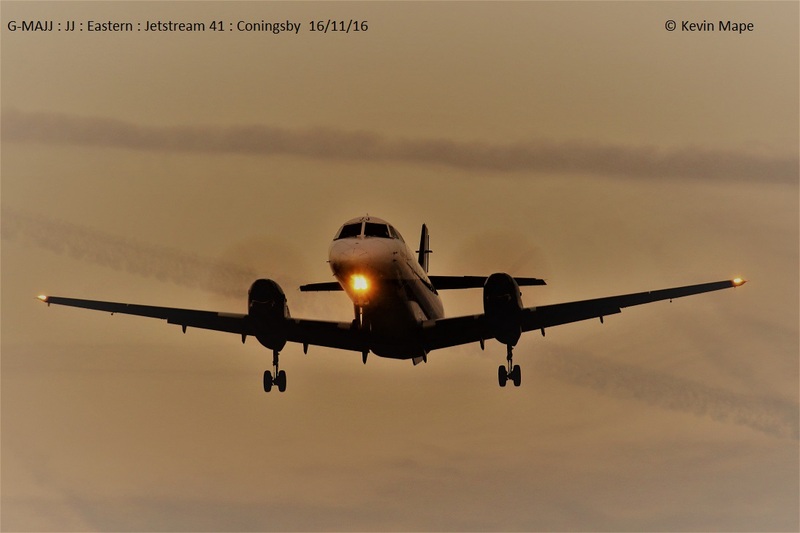 G-MAJJ/JJ/Eastern/Jetstream 41 c/s “East Flt 104” – in “105” – out. Towed from Hangar 2 to Foxtrot – ZJ940 & ZJ945. ASP – 8Sqn – ZH103. BBMF – Spitfire TE311 & P7350 engine test. ZK325/FK noted on tow from echo. Sierra -Tornado GR4’s ZD849/110 & ZA453/022. “Cobra 31” – Ground abort. “Cobra 32” – Ground abort. “Warlord 22” – Ground abort. Triplex 12″ – Ground abort. 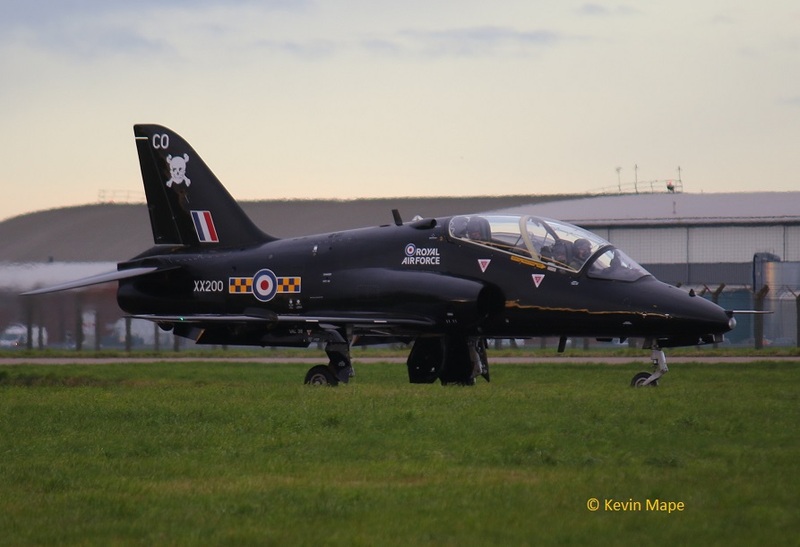 G-BYXB/XB/3FTS/Tutor T1 c/s ” Cranwell 41″ – T&G departed. Wash Pan – ZJ920/R/ Unmarked – towed back to TMF. Noted on Sierra – EO, O, BU, FY, FD, GS. ZA682/18-27Sqn/Chinook HC4 c/s “Vortex 596” – Refuel on Sierra. 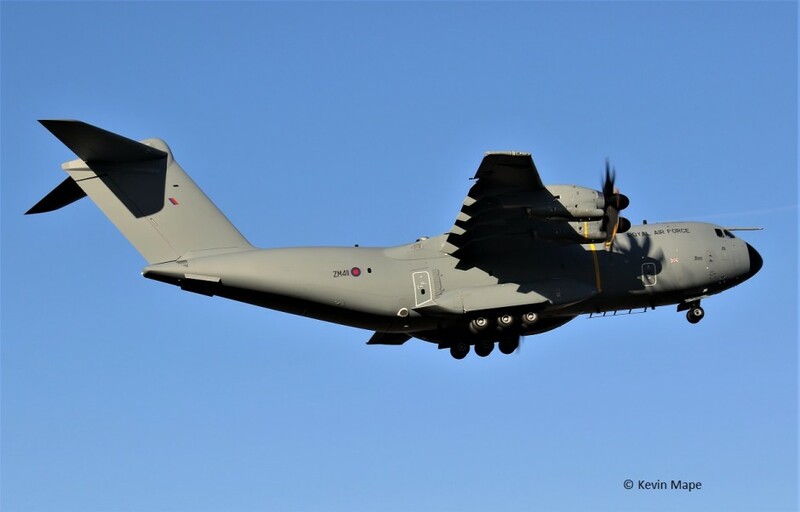 ZM411/70Sqn/A400M Atlas c/s “Ascot 406” – multiple overshoots. 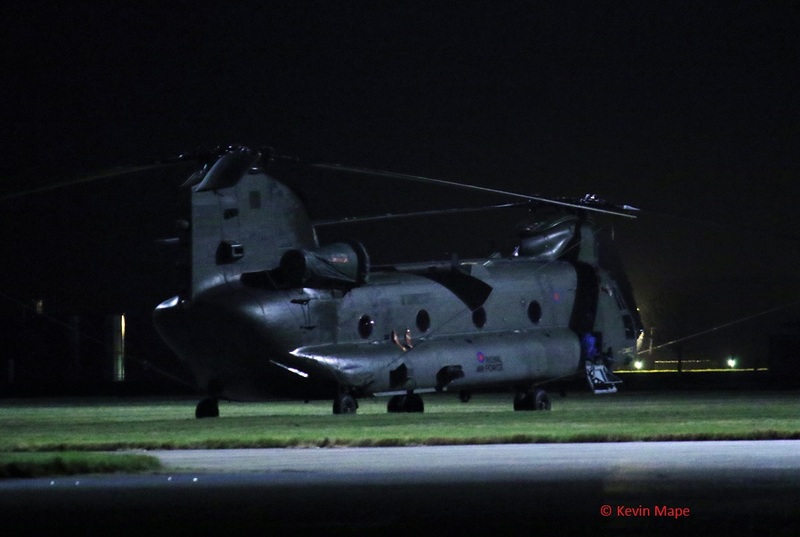 ZA682/18/27Sqn/Chinook HC4 c/s “Vortex 596” – Working on Holbeach Range. ZF417/417/1FTS/Tucano T1 c/s “LOP 18” – Overshoot. ZE376/6Reg/Lynx AH9 c/s “Army Air 674” – Overfly. 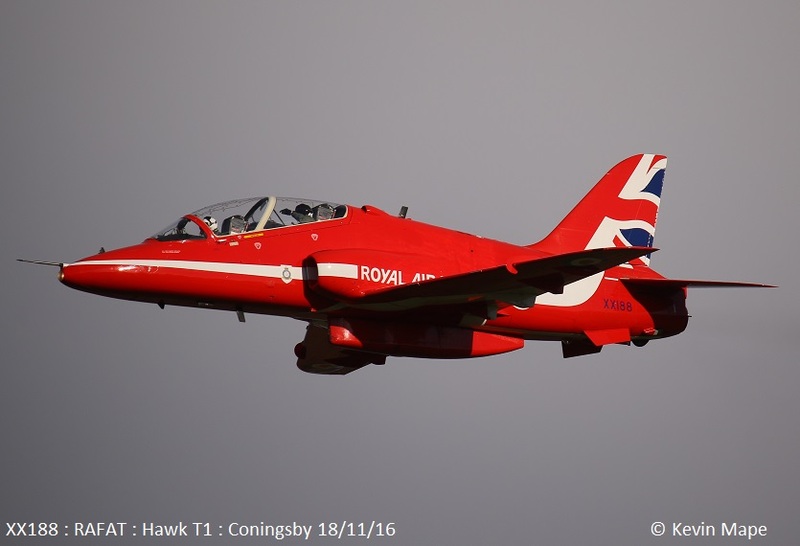 XX311/RAFAT/Hawk T1 c/s “Scampton 03” overshoot. ZD982/18/27Sqn/Chinook HC4 c/s “Vortex 592” – Working on Holbeach Range. 29th Tue Log thanks to Rich & Susie. 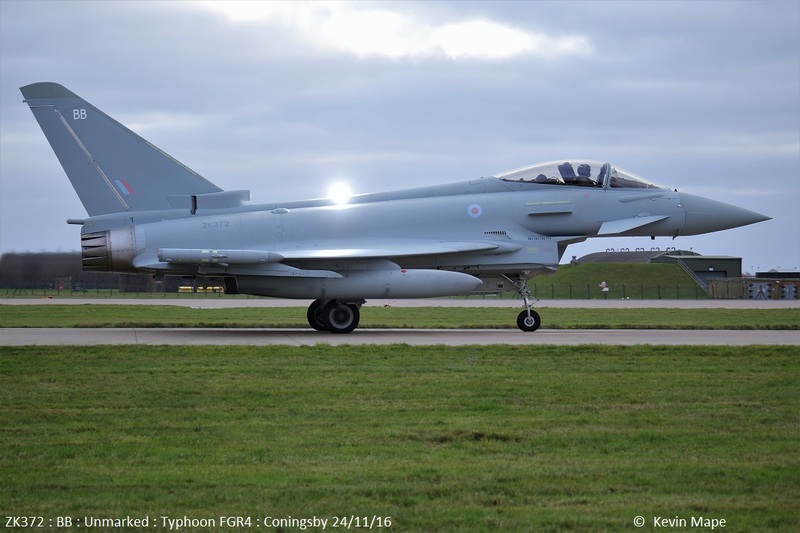 ZK300/H/Unmarked c/s “Typhoon 21” – Delivery to Lossiemouth ex TMF. 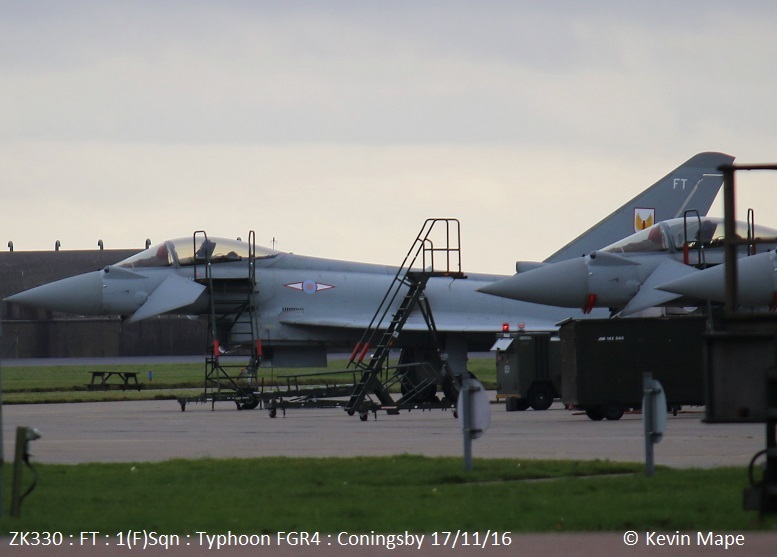 ZK347 EF/Unmarked c/s “Typhoon 51” – Delivery to Lossiemouth ex TMF. 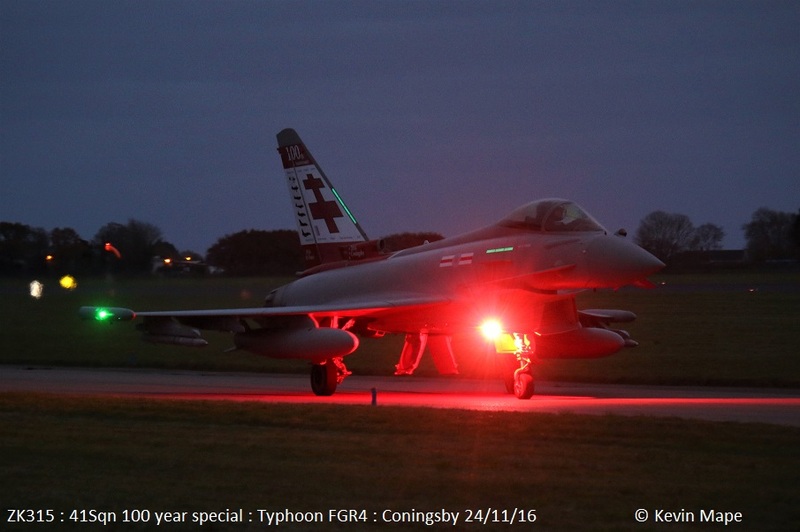 ZK382/BG/29(R)Sqn c/s “Typhoon 25” performance departure. 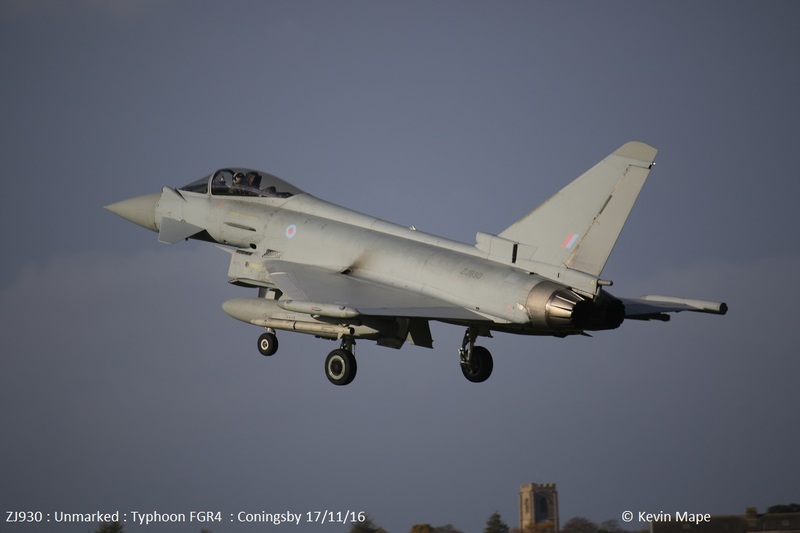 ZK380/T/II(AC)Sqn c/s “Typhoon 21” From Lossiemouth for TMF. 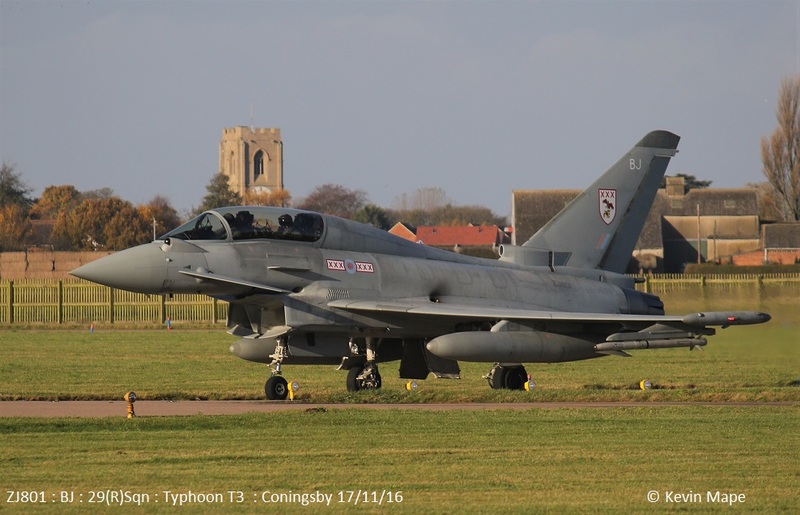 ZJ801/BJ/29(R)Sqn c/s “Typhoon **” – Ground abort. ZJ707/0/60(R)Sqn/Griffin HT1 c/s “Shawbury 94” – Parked on Sierra. ZE376/3Reg/Lynx AH9 c/s “Army air 374” – Overfly. G-BYUB/UB/3FTS/Tutor T1 c/s “Cranwell 37” Touch & go. 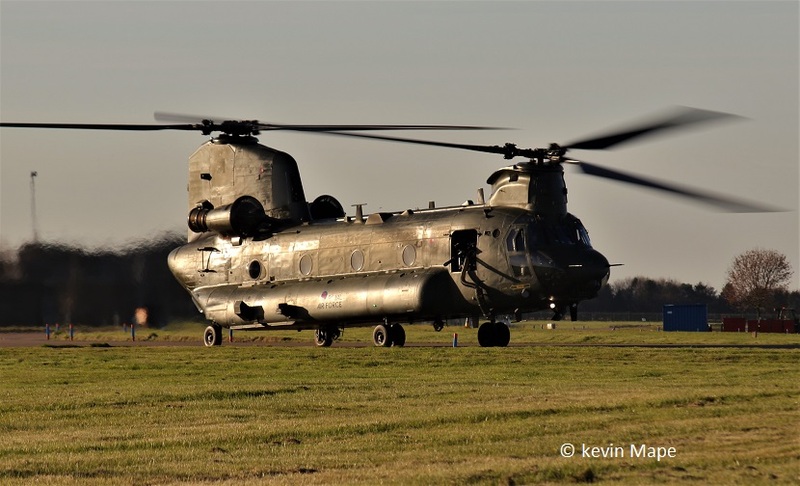 ZA682/Unmarked/Chinook HC4 c/s “Vortex 596” – To Holbeach. Spitfire LF XVIe – TE311/4D-V.
Spitfire PR XIXe – PS915/-. ZJ921 : E : u/m : noted outside TMF 8/11/16. 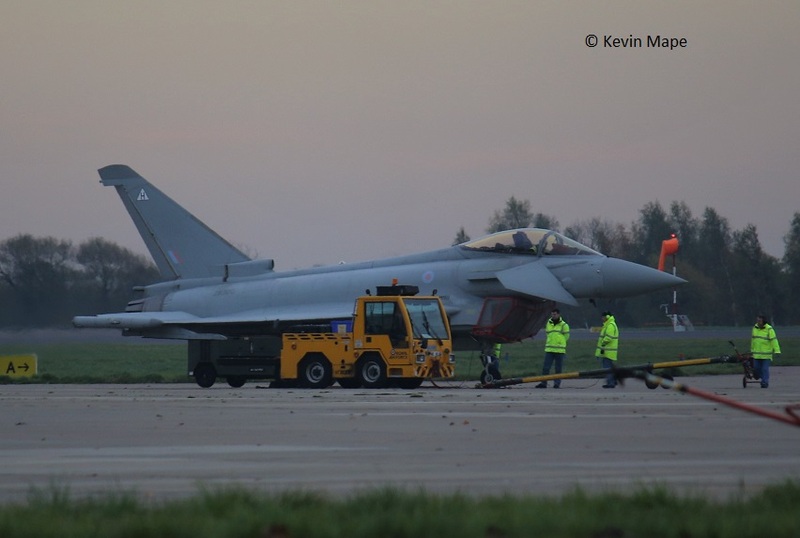 – Towed out of Paint shop 17/11/16. 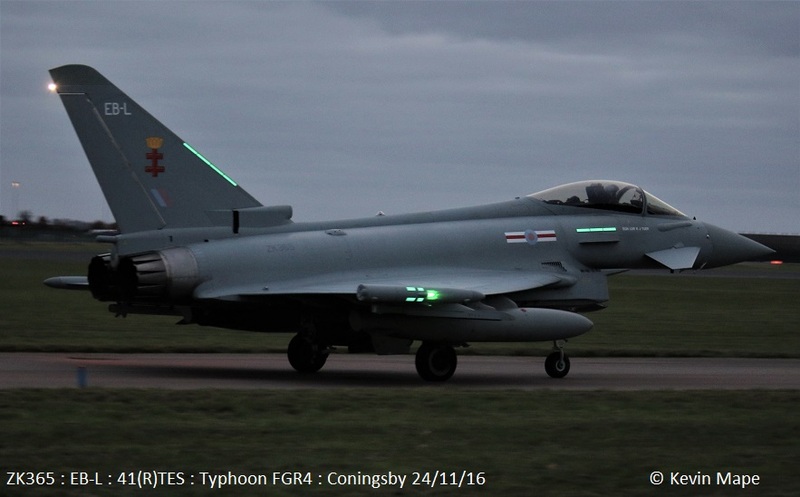 ZK308 : BW : u/m : – Noted code only 3/11/16 – Delivered to Lossiemouth as “Lossie 79” 3/11/16. ZK318 : FG : u/m : Noted outside TMF – APU runs 1/11/16. 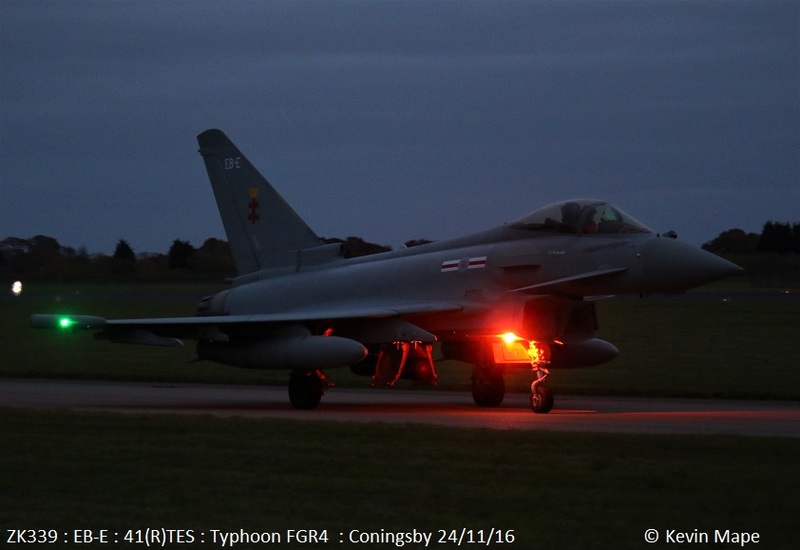 ZK334 : A in Triangle : u/m : Delivered to Lossiemouth as “Typhoon 21” 8/11/16. 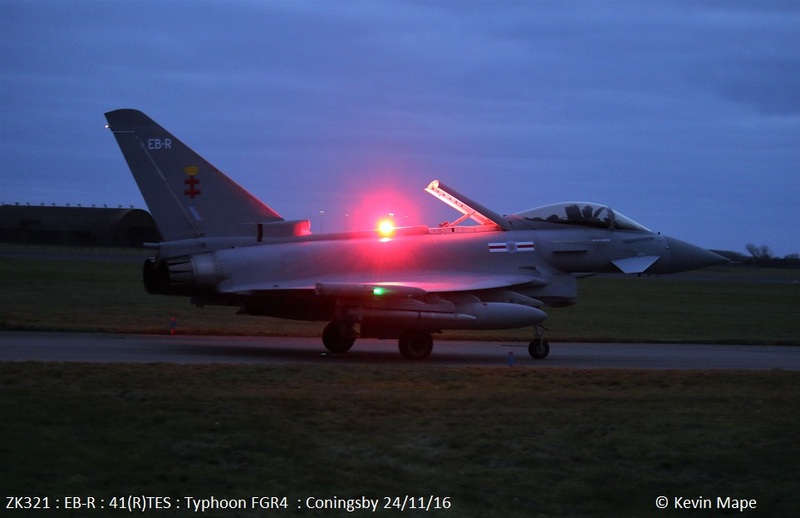 ZK337 : FP : u/m : Delivered to Lossiemouth as “Typhoon 76” – 8/11/16. 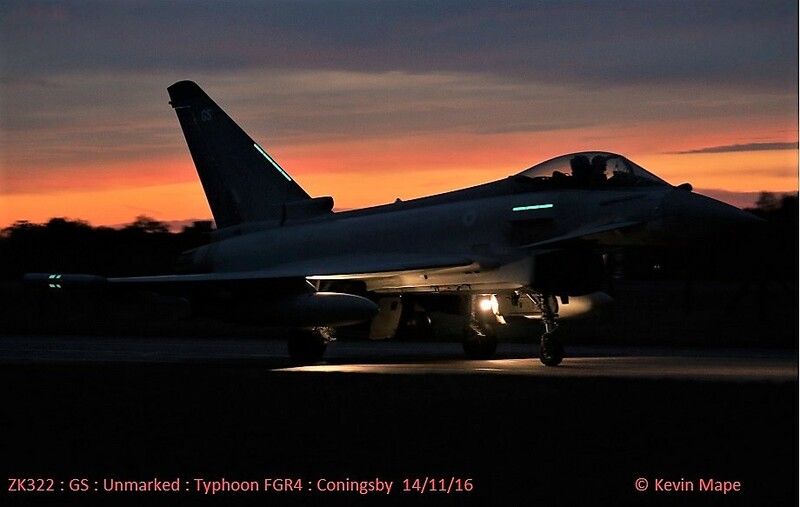 ZK347 : EF :u/m : Noted on the ASP – 23 & 24/11/16. ZK369 : u/m : Engine runs on the ASP 22/11/16. ZJ940 : marked (DJ666) – Noted outside Hangar 2 – minus rudder 1/11/16. ZJ944 : u/m : (CAT 3 ) awaiting repair.